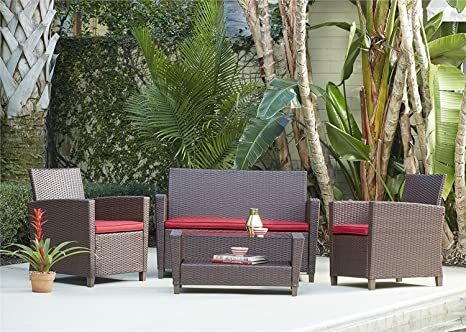 Create a cozy and comforting outdoor lounge area with COSCO Outdoor Living 4 piece Malmo resin wicker patio deep seating conversation set. Featuring resin wicker chairs with cushions, enjoy a night of comfortable relaxation with friends. A tempered glass coffee table with shelf completes this set with a little bit of storage for a book or candle. Enjoy quiet time with a book or chat with a friend all night in this 4 piece conversation set. COSCO Outdoor Living, a brand of COSCO Products, offers space saving folding groups to roomy conversation and dining sets, designed to meet all your outdoor patio needs. Our collections help create your own outdoor lounging spaces or cozy living areas on your patio or deck. Our outdoor products are designed with form and function in mind to help you create the outdoor space you dream of. Design aspects for COSCO Outdoor Living products include innovation, style, and elegance to suit any customers home dcor or design motif. Manufactured with durable, weather-resistant materials, our furniture is built to last and to impress. We offer different color options on multiple sets, making it easy to fit your personal taste. We invite you to sit back, relax and enjoy your COSCO Outdoor Living furniture. 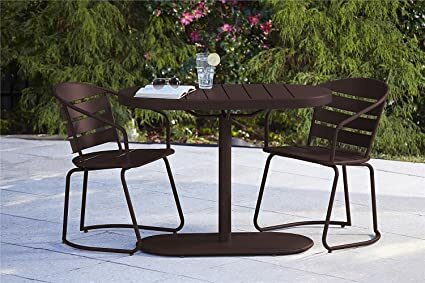 Our charming Outdoor Cosco Outdoor Living 3 piece Metro Retro nesting bistro steel patio furniture set is perfect for the apartment dweller or cozy outdoor spaces. Two lovely slat-back arm chairs and an oval pedestal-style slat-topped table fit comfortably in your small space, making it truly delightful. When not in use, simply slide both chairs easily up to the table where they nestle in like puzzle pieces. Now the unit is compact and out of the way. Arrives fully assembled. It will last for years to come. 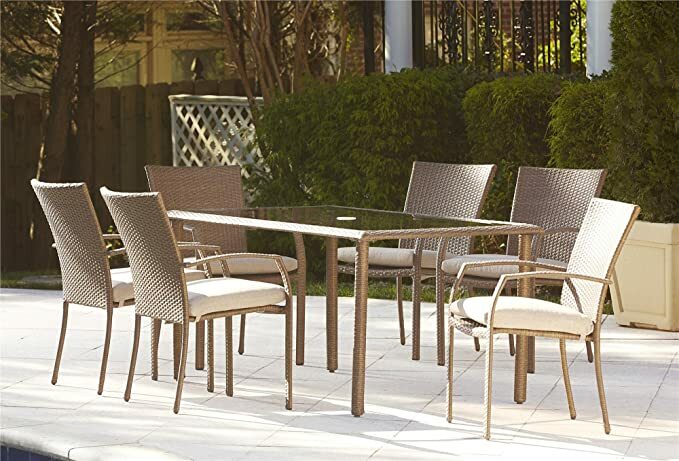 Dine in style with the COSCO Outdoor Living 7 Piece Lakewood Ranch Dining Set in tan and amber brown. The ample tempered glass-topped table is the centerpiece of this set, and will easily hold your dinner and all the extras. The table also includes an umbrella opening to hoist your umbrella (sold separately) for those bright, sunny days. Six comfortable and sturdy stacking dining chairs with plush seat cushions complete this dining ensemble. Chairs are no assembly required. All pieces are constructed with a strong steel frame and wrapped in our resilient resin wicker. As you and five of your closest friends or family unwind at your Lakewood Ranch 7 Piece Dining Set with steaks on the grill, feel free to relax and enjoy outdoor living. Items in this set may be purchased separately to create your own unique outdoor living set. The 6 stacking dining chairs (88596ABTE) can be purchased together, and the dining table (88698ABTE) can be purchased separately. 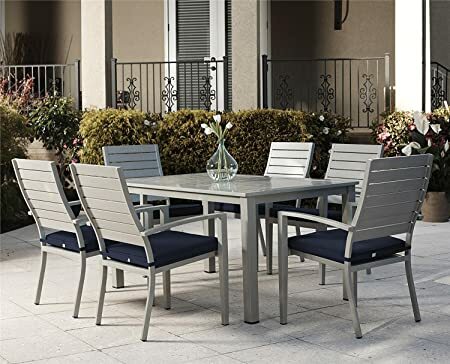 COSCO Outdoor Living, a brand of COSCO Products, offers space saving folding groups to roomy conversation and dining sets, designed to meet all your outdoor patio needs. Our collections help create your own outdoor lounging spaces or cozy living areas on your patio or deck. Our outdoor products are designed with form and function in mind to help you create the outdoor space you dream of. Design aspects for COSCO Outdoor Living products include innovation, style, and elegance to suit any customers home dcor or design motif. Manufactured with durable, weather-resistant materials, our furniture is built to last and to impress. We offer different color options on multiple sets, making it easy to fit your personal taste. We invite you to sit back, relax and enjoy your COSCO Outdoor Living furniture. 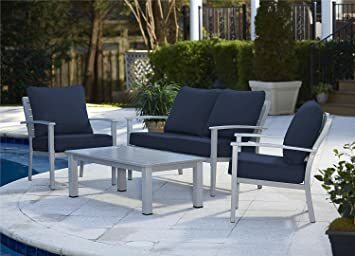 You can capture the memories of days spent in paradise in your own outdoor space with our Cosco Outdoor Living 4 piece Blue Veil brushed aluminum patio furniture conversation set with cushions and coffee table. Invite your friends over and serve fruity beverages with little umbrellas. This 4 piece conversation set includes two slat-backed chairs and a loveseat featuring plush removable back and seat cushions. The lightweight slat-topped coffee table accompanies the set. For extra support and durability, the set is constructed with powder-coated aluminum frames in light gray. It features an artisan hand-painted wood grain finish. Both the frame and the fabric are durable and will last while being easy to clean and maintain. 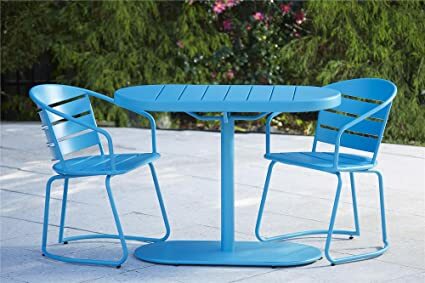 Our COSCO Outdoor Living 7 piece Blue Veil hand painted aluminum patio furniture dining set with cushions is reminiscent of a carefree and relaxing paradise. Remember the colors, fresh breeze, and the calm setting. By incorporating this dining set into your outdoor space, you will create that paradise you long to experience again, and much more affordably. This 7 Piece Dining Set includes six slat-backed chairs with a plush removable navy seat cushions. The ample lightweight slat-topped dining table will easily hold almost anything you put on it. 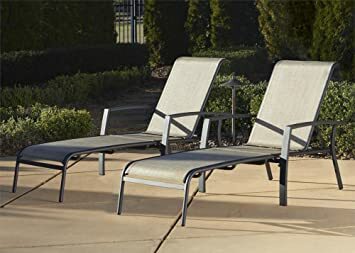 For extra support and durability, the set is constructed with a powder-coated aluminum frame in light gray. It features an artisan hand-painted wood grain finish. Both the frame and the fabric are strong and will last while being easy to clean and maintain. Additional benefits include no assembly required design and all 6 chairs stack for convenient storage. COSCO Outdoor Living, a brand of COSCO Products, offers space saving folding groups to roomy conversation and dining sets, designed to meet all your outdoor patio needs. Our collections help create your own outdoor lounging spaces or cozy living areas on your patio or deck. Our outdoor products are designed with form and function in mind to help you create the outdoor space you dream of. Design aspects for COSCO Outdoor Living products include innovation, style, and elegance to suit any customers home dcor or design motif. Manufactured with durable, weather-resistant materials, our furniture is built to last and to impress. We offer different color options on multiple sets, making it easy to fit your personal taste. We invite you to sit back, relax and enjoy your COSCO Outdoor Living furniture. Consider creating a personal paradise right in your own back yard. Our COSCO Outdoor Living 4 piece Lakewood Ranch woven wicker conversation set is so relaxing you’ll never want to leave. An amber and tan color scheme is sure to match your current patio furniture and home, creating a seamless transition between indoor and outdoor living. The lounge chairs and loveseat feature navy removable plush seat and back cushions. The coffee table features a tempered glass-topped table to hold drinks, magazines, decorations, and more. All pieces are constructed with a strong steel frame for extra support and durability, wrapped in our resilient classic woven resin wicker design. All materials are weather resistant and easy to clean. Upgrade your outdoor space with this 4 piece conversation set for your next party or gathering. Items in this set may be purchased separately to create your own unique outdoor living set. The 2 lounge chairs (88591ABTE) can be purchased together, and the loveseat and coffee table (88592ABTE) can be purchased together. COSCO Outdoor Living, a brand of COSCO Products, offers space saving folding groups to roomy conversation and dining sets, designed to meet all your outdoor patio needs. Our collections help create your own outdoor lounging spaces or cozy living areas on your patio or deck. Our outdoor products are designed with form and function in mind to help you create the outdoor space you dream of. Design aspects for COSCO Outdoor Living products include innovation, style, and elegance to suit any customers home dcor or design motif. Manufactured with durable, weather-resistant materials, our furniture is built to last and to impress. We offer different color options on multiple sets, making it easy to fit your personal taste. We invite you to sit back, relax and enjoy your COSCO Outdoor Living furniture. 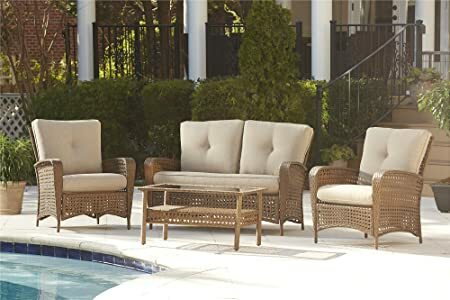 Create a cozy and comforting outdoor lounge area with COSCO Outdoor Living 4 piece Malmo resin wicker patio deep seating conversation set. Featuring resin wicker chairs with cushions, enjoy a night of comfortable relaxation with friends. A tempered glass coffee table with shelf completes this set with a little bit of storage for a book or candle. Enjoy quiet time with a book or chat with a friend all night in this 4 piece conversation set. Be ready for guests with instant seating for four. Comfortable for entertaining and compact for storage, our sets feature durable steel frames and a powder-coated finish. The more the merrier. This tan set comes with a sturdy 34″ square table with low maintenance and easy to clean vinyl top. The four chairs are upholstered in an attractive fabric with padding on the seat and back for additional comfort. The tables and chairs are made of a sturdy steel frame and rubber tips to protect your floors. The table and chairs fold for easy storage when not in use.